The surprise, after 15 years of planning and development, was that the ghostly particles from outer space were so easy to see. 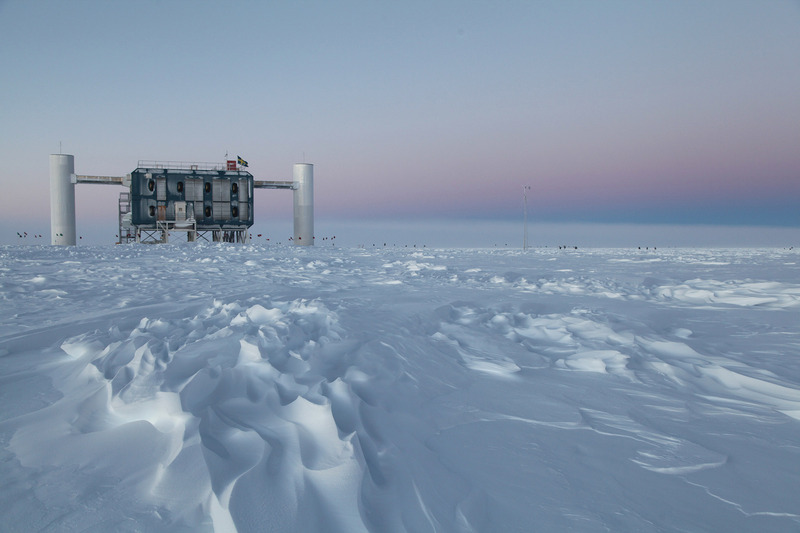 After all, “The neutrino is a tough particle to deal with,” says Francis Halzen, principal investigator of IceCube at the University of Wisconsin–Madison, where the detection was made. Here’s the track of the most powerful neutrino ever observed: estimated energy 1.14 million-billion electron volts. Each balloon shows the activation of a single detector in a block of frozen water at the IceCube Neutrino Observatory at the South Pole. IceCube physicists named the lil’ newt Ernie. Scientists have produced neutrinos in laboratories, measured them outside nuclear reactors, and detected them streaming from the sun. This week, in Science, the IceCube Collaboration reports the detection of 28 high-energy neutrinos, including energetic Ernie at 1.14 (see portrait at right). 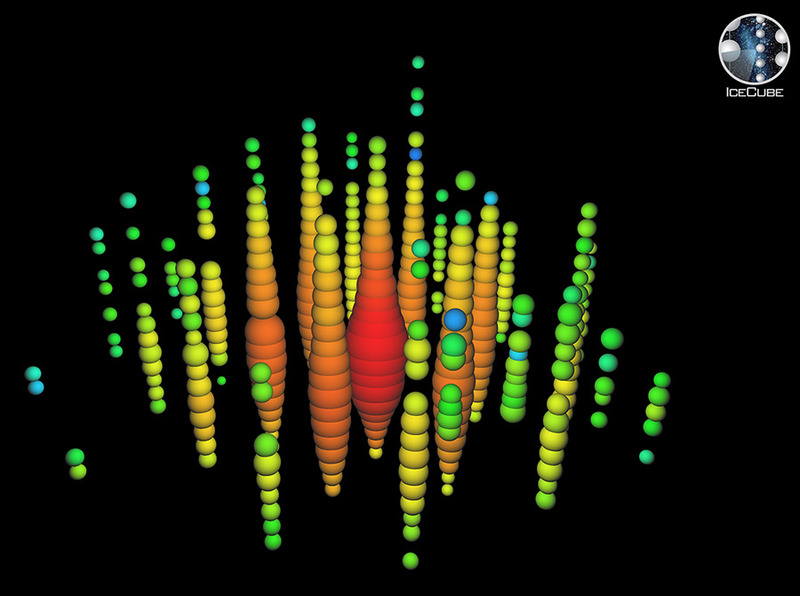 These neutrinos were so energetic that they must have come from outside the solar system. Because many of them did not line up with the plane of our galaxy, they likely came from beyond the Milky Way. But what’s a neutrino, and why should we care? For starters, they are elusive. Neutrinos almost never interact with matter. That makes them almost invisible. Billions of neutrinos have passed through your body since you clicked over to this page. His postulation was, as they say, close enough for horseshoes and hand grenades. But a vanishingly small percentage of neutrinos do strike other particles, creating a particle called the muon that is much easier to detect. Neutrinos make muons and muons make blue light. Ice-bound detectors see light, signal computers that point at neutrino source. But that vice is also a virtue. That failure to interact allows neutrinos to travel unscathed from the most distant reaches of the universe, where they are (presumably) born in catastrophic collisions or titanic explosions — or something even weirder. Finding that something is the ultimate goal of IceCube, an upside down telescope at the South Pole, where scientists have converted a cubic kilometer of pure ice into the world’s largest astrophysics experiment. 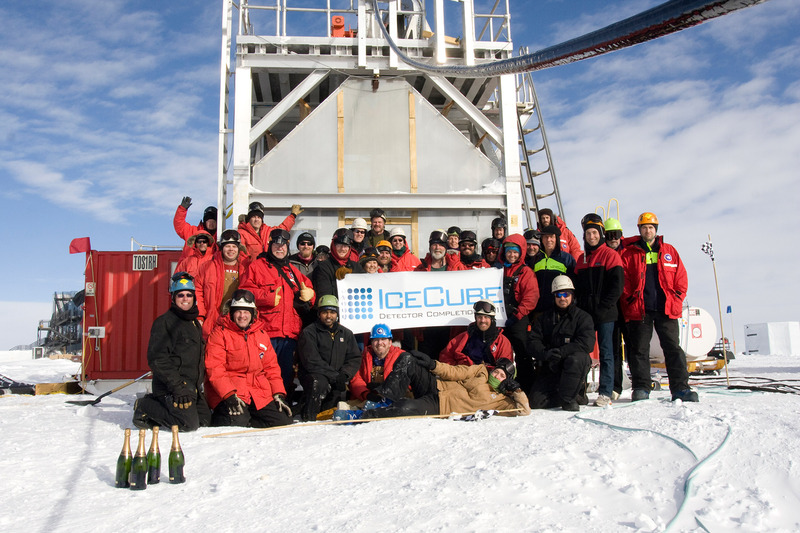 After six years of deployment, the IceCube Neutrino Observatory was completed in December, 2010. The project is headquartered at Madison and funded by the National Science Foundation. The IceCube detector was completed in December 2010 after seven years of construction. It was built on time and on budget and in its first two years has exceeded design specifications. The bad news is that it’s too soon to know any specifics about the source of these ultra-high energy particles, which must be something amazingly energetic. At IceCube, a digital data dance begins the moment a photon of light triggers eight spherical detectors deep in the ice, and a digital notice is sent to the surface. The computers weed through gobs of data: From 6,000 “events” every second, it sifts out one neutrino every six minutes or so. 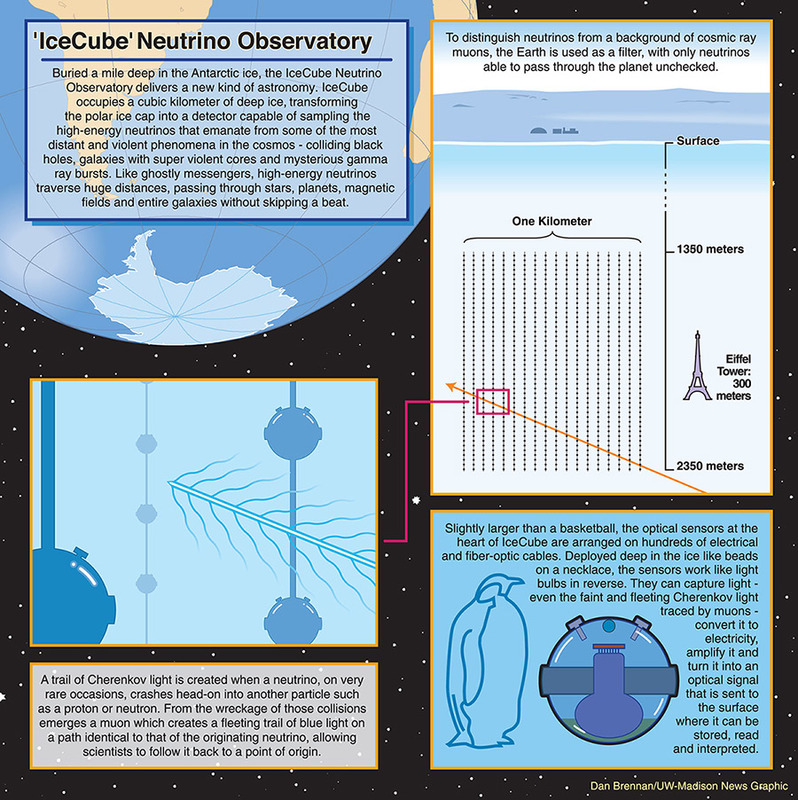 The IceCube Laboratory at the Amundsen-Scott South Pole Station in Antarctica is the world’s largest neutrino detector. Data processing — removing boring signals — happens in near real-time here, and interesting neutrino events go to the IceCube Collaboration at UW-Madison for further study. But most of those neutrinos come from the sun… so further winnowing leaves about one high-energy neutrino per month, says Halzen. To see a neutrino, scientists generally look for the muons that are created after the rare collision between a neutrino and a particle in the target. Because such collisions are rare, bigger detectors rule. In the 1960s and ’70s, scientists went to great lengths (and depths) to find neutrinos, burying large masses of water, oil or iron plates deep underground, where the target was sheltered from spurious, lower-energy signals. In 1987, Halzen had a brainstorm. Why not use the Antarctic ice-cap as your target, and freeze detectors inside an essentially unlimited mass of ice? It was an unlikely scheme: A telescope that looked downward. A gadget designed to see things that are phenomenally shy. And an astrophysics experiment built around a target of unknown purity. The blue light created by muons will only travel eight meters in distilled water, but the muons must travel much further to be seen by at least eight IceCube detectors. Eight is the borderline that makes an event energetic enough to be worth further study. Seeing fresh dust at a young supernova: Source of the planets?